Situated in the vibrant distract of Seven Dials, one of Brighton and Hove’s most sought-after spots, is our latest Shared Ownership development, Artisan. Each one, two and three bedroom apartment at Artisan boasts an expansive, open plan living space, constructed with comfortable living in mind. Furthermore, the layout of each room has been carefully designed to be as efficient as possible, providing ample storage space for all your possessions. 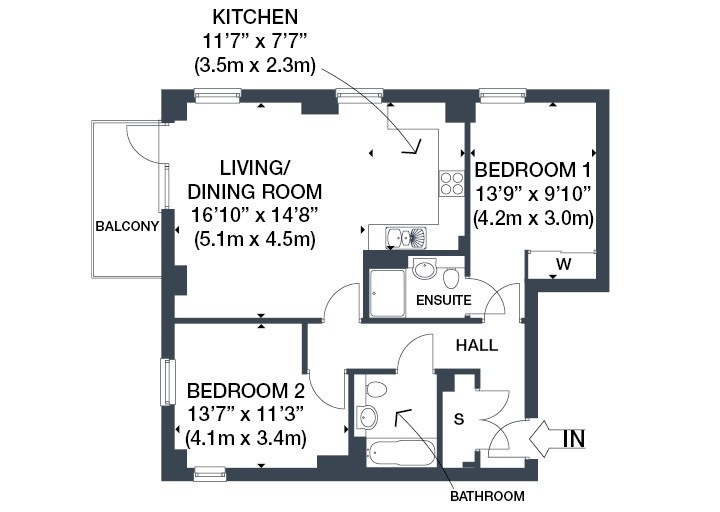 See below for the floorplan from plot 11, first floor. In addition to the abundance of space within each apartment, Artisan’s large windows have been designed to bathe the interior in natural light. The close proximity to the sea also provides stunning views from the private balcony – a feature that comes as standard in every apartment. As well as a private balcony, each resident gets access to a communal rooftop and terrace garden – perfect during a long summer’s evening. Apartments at Artisan start at £113,750 (based on a 35% share) and are available to move in immediately. To book a viewing at our Artisan development, register your interest on our dedicated Artisan webpage. Plot 45 (as shown below) features two large windows which let in an abundance of natural light into the open kitchen and living space. Views over the rooftops towards Hove Green are available from the private balcony. Our brand-new Shared Ownership development, Artisan, is heaving located in the vibrant borough of Hove. Featuring a collection of one, two and three-bedroom homes, Artisan is coastal living at its best. To receive exclusive monthly email updates about this development, including Brighton, images, open day details, launch dates and prices, register your details with us now at our dedicated Artisan webpage.